The basic idea of Blocking is to use water to relax the fabric and stretch it out into the desired shape. After proper blocking, short of re-soaking the project, it will hold its shape well. This can correct a myriad of minor issues and even some mistakes and will make mounting/framing a project infinitely easier. Knitting and Lace makers find it of particular use as it helps give their pieces the appropriate shapes and once finished will make the piece stay that shape- very useful when you're making clothes! While Knitters and Lace makers will use 3 types of blocking- wet, steam, and spray blocking, I'm only going to cover wet blocking in detail. Steam and spray blocking involve pulling an item out to the shape you want, and then either spraying it with water or using steam over the piece to relax it into the shape. However, with cross stitch and embroidery pieces, wet blocking is, in my opinion, just better. Because you're mostly interested in the stitches, and your work is unlikely to be shaped differently from the final product as knitting can be, its much more likely that you'll be correcting lines and flattening fabric/stitches rather than changing the shape. Your project- still wet from the cleaning preferably! A flat surface big enough to hold the entire project, and capable of being stabbed into by pins/thumbtacks- using a frame can also work. A word before you start about making this easier. If you have completed your project and you did not actually stitch or otherwise stop your edges from fraying, blocking will be harder. I always suggest sewing around your project with a simple whipstitch or using a zigzag on the machine around it even before you start stitching, but at this stage, it really helps to have it done. Lay your project onto the surface. Pick one side, and start pinning down the side. At this point, its not necessary for it to be exactly straight. Just ensure that you pull the fabric taut on the way down. Cross to the opposite side, and do the same thing, pulling the fabric not just down, but across so that you stretch it across from the opposite pinned side. Always go from one side across to its opposite before moving on to the adjacent sides. This gives you a good basis for aligning your corners when you start the alternate sides. Do the same on the alternate sides. Note on pinning- if you're using thumbtacks, obviously pushing straight down works just fine. But if you're using pins (like I am in the photos) make certain you angle the pins so that the heads are away from the project. This will keep them from getting out of shape, or from the fabric sliding down them and losing the shape. I generally go back after doing all four sides, and take out one pin, pull further, repin, rinse and repeat. You really want to get it nice and taut, so don't be afraid to take a couple of times around it just to make certain you really can't get it too much tighter. If your outside of the fabric is warping around each pin, try pinning further in. You want the pins to support the pull, but you don't want the pull to be so hard that it bends the pins back or that it warps your fabric out of alignment! A lot of the time, it isn't particularly necessary to get the edges perfectly straight, especially if your frame/matting will cover the edges of the project, or if you haven't actually stitched all the way out to the edges. But if you have stitched the full thing, and your sides will be showing on the final peice, this is how I get it to look even better. Take your ruler and lay it touching each corner of one side, making certain that you've pulled the corners taut in both directions already. Now, using the ruler as a guideline, re-pin along the edge making certain to pull the edges of the project up to meet the ruler. The straighter you get it, the straighter your project will be when it dries. If your project doesn't exactly have a straight line, you can use the fabric's own blocks/threads as a guideline to pull it straight. As before, when you finish one side, go across to its opposite and do the same. Then do the other ones. When you finish all four sides, go back and check the straightness of all four, starting from the beginning again. Pulling it straight on the other side shouldn't have made much of a difference, but the straighter you get it NOW, the better it will turn out. Find somewhere to put it that won't end up getting ruined if excess water drips off! The bathtub works well- but wherever you put it, make certain it won't bend or get pressed on. Sit back and let nature do its work. Just let it dry. You want it to be completely dry before you take it off. I usually leave mine for a day or two, or three, or well, until I'm ready to face working on it again. You won't be able to easily block a piece when its cut out without potentially destroying the outer edge of your project. So block it before you cut, and pin OUTSIDE the stitching. P.S. I've had people ask about speeding up the drying process. I don't suggest it unless it is absolutely necessary. Hair dryers can burn fabric and discolour threads. Tumble drying first doesn't allow you to pull it as taut as you would if you block it while wet. The only thing that you could do, is skip blocking and iron it. But personally, I think your results will not be as good if you do that. If you're going to take the time to create your project and get that right, you really should take the time to make certain it is dealt with right afterwards! Hello. I'm just starting out and I was reading this post about blocking. 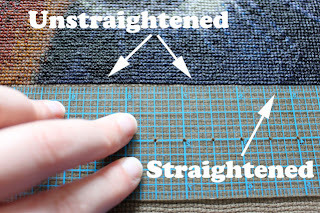 It sounds really helpful, but what sort of material are you using to pin the cross stitch to? I'm not sure if I have anything I can use and I wasn't sure what to buy. Bleed onto your fabric from the water. Any board will do (although I don't recommend cardboard). Wooden frames can be used (you can just use tacks instead of pins). I've known someone who used their dinner table to great success, but it did leave holes where the tacks were. I recommend non-plastic things, mostly because the water will sit on the surface and take longer for your project to dry. Thanks for the quick reply! I guess that means I can probably use my ironing board for the smaller projects and I can think of something else if I do something larger one day.